Everyone has a name now and is spoken for. I’m thrilled with the families they will be going to. 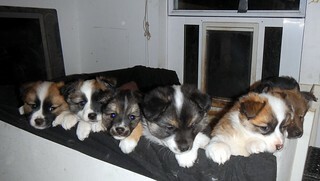 It’s so neat how each puppy seemed to pick out their family, with a little help from me, of course. But from left to right, we have Rúnar, Kópur, Elska, Stina, Siggi, Loki and Freyja. They are going to Maine, three are staying here in Vermont, one to western Massachusetts, one to San Diego and one to Oregon. Stina is staying with us. They are six weeks old right now. They are busy, busy, busy! They run in and out of the dog door all day long. If I open the door from the living room to the outside, little bells jingle and they all rush outside, because they know I’m going outside. 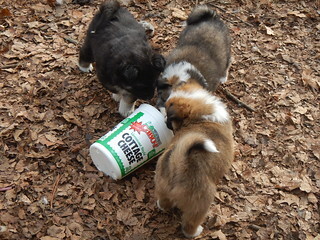 I hope that helps with potty training them when they get to their new homes. With the access they’ve had outside with the dog door, it can be tricky to get them to tell you when they want to go outside, and I hope the bell helps. I can’t tell you how nice it is to have potty trained puppies, though. It lets them roam freely around my house and get socialized really well without having the stress of them having an accident. They are huge fans of the raw food that I provide. They think raw rabbit is delicious. They get about a quarter of one to work on over the course of the day, and they love it. Disa doesn’t share her meat with them — she growls at them, bares her teeth, to teach them manners. When she’s done, she lets them have it, and they are learning to wait patiently. Gaela, on the other hand, lets them have hers first and then she takes what is left over. I wonder if she’ll do that when she’s a mama instead of a big sister. They also have free-access to a lamb and rice kibble, cottage cheese, raw milk, and wet cat food. They are all thriving, chubby little monsters. Gaela is such an awesome big sister. She plays with them so well, and is willing to babysit for all seven for hours at a time. She keeps them all close by, plays with them, lets them fall asleep on her, teaches them about sticks and toys. She can’t stand to hear any of them whimper or cry out, and is instantly there to see what’s up. She’ll play with them one on one, too, as in this little video of her and Loki, who went at it for nearly an hour in the whelping box one afternoon. I have worn out more batteries than I can count trying to catch pieces of adorableness. We’ve only seen Disa playing with them a couple of times, but I hope that as she gets them weaned, she’ll have time to play with them too. Because weaning is starting now. They aren’t hungry — they have free access to all sorts of food plus raw milk. They still want to nurse, though, especially when they first wake up or when they are really tired and need to sleep. I think she’s nursing them probably four times a day at this point. Weaning is well on the way, poor puppies. Disa is really thin, though, so it’s time. They are often sleeping outside now, voluntarily. 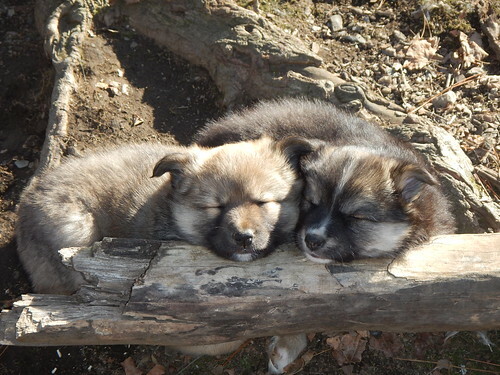 I’ll often find one or two of them sleeping on the deck just outside the whelping box, and now in the middle of the day, we’ll find them sleeping up near the tree or under the garden cart. Even when it’s really cold overnight, in the teens, a couple of them will still be out of the deck instead of inside the whelping box, little freaky Icies. They are still at the point of crashing hard — when it’s time to nap, nothing is going to stop it, boom, down for the count. Playing mostly involves chasing each other and tug of war. Toys are suddenly interesting and fun. I put all the toys in the toybox three or four times a day, and they take great joy in emptying it out and spreading the toys around far and wide. Gaela is almost always smack in the middle of them, holding one end of a toy and letting many of them grab on, then grrr and arg until someone lets go. Bjarki used to do that with the first litter, and it’s much fun to watch. I spend a lot of time out with them and they make me laugh with their antics. This entry was posted in Dogs, Uncategorized. Bookmark the permalink. Post a comment or leave a trackback: Trackback URL. Sorry to see I missed your happy event and adoption of adorable puppies. I would love to have been there to adopt one of them- Beautiful Mom too. We just lost our male Chi/Pom, his sister, a mini weener dog/ hound is alone now. we have each other- Hugs.